Another look around one of Chicago's colourful neighbourhoods. Wicker Park takes its name from the two brothers who bought the patch of land along Milwaukee Avenue in 1870. 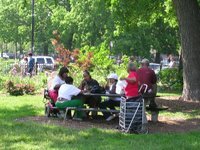 For them the timing was perfect because a year later came the Great Chicago Fire, after which homeless Chicagoans looked to build new hous es. The area became popular with wealthy Swedish and German merchants, particularly those in the brewery trade as big mansions sprouted up along the streets of Hoyne and Pierce. 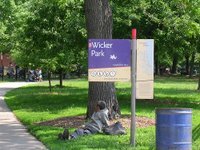 After WWII Wicker Park became more ethnically diverse with an influx of Puerto Rican immigrants but with families heading to the suburbs and no investment the 1970's saw it become a place to avoid as arsonists and criminals moved in. In the 80's though efforts by community development groups to stabilize the neighbourhood through new affordable-housing construction coincided with the arrival of artists attracted by the neighborhood's easy access to the Loop, cheap loft space in the abandoned factories. 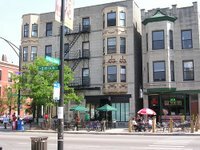 Today the area has benefited as Bucktown's cheaper cousin and is an eclectic mix of musicians, artists, and young professionals. In my 3 years in the city I have seen West Division street attract plenty of cool clothes shops and bars and the 2004 film of the same name set in the neighbourhood didn't do it any harm at all. 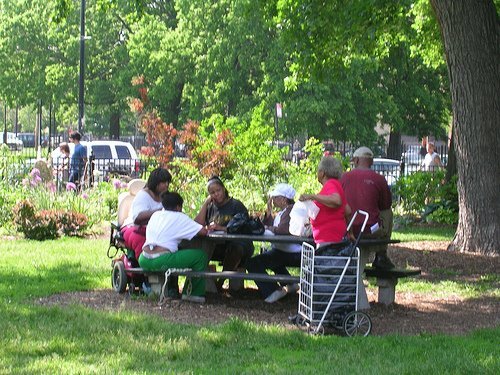 The park itself complete with fountain provides a centrepiece and is a popular hangout for families and the homeless alike. The different styled mansions mostly remain, lording it on quiet streets s andwiched between the busier thoroughfare's of Ashland (to the east), Division (to the south) and Western (to the west). 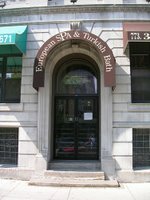 The old beer magnets homes aside, Chicago's only remaining Turkish Baths, opened for a 100 years and one of only a handful left in the United States, plus the recently closed Czar bar are all throwbacks to days past. 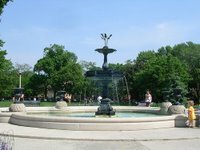 Another reminder of the area's roots is the Polish Museum of America (984 N. Milwaukee Ave). It was established in 1935 and is one of the oldest ethnic museums in America. Hidden away is the Chopin Theater (1543 W. Division St) producing I read somewhere "non-traditional, non-commercial plays purely for the sake of art." If want to find out of the beer merchants left a legacy then try Lotties Pub (1925 W Cortland St) or the newer Small Bar (2049 W Division), which shows Premiership games live. If it's a cup of tea and a slice of cake that you want, be sure to visit the Alliance Bakery (1736 W Division St). Or for something a bit stronger sample the belly dancing and hookah at Sigara further up the street at 2013 W Division. One of my favourite places to eat in Wicker Park is the retro-styled Club Lucky (1824 W. Wabansia St). It has a mixed crowd and waitresses dressed in sleek red-striped jackets serve you, whilst Frank Sinatra and Dean Martin croon in the background. 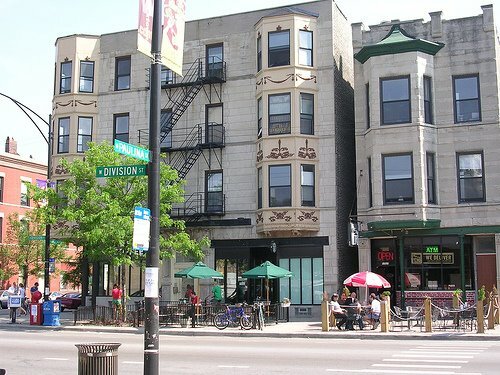 Wicker Park is the quiet but less refined cousin to Bucktown, a short stroll away. More quirky than trendy West Division Street is where most things happen, although venturing onto its side streets will give a lot more away in terms of Chicago's ethnic history than many other of the cities environs.